Grilled cheese sandwiches are so tasty and it's so easy to add new ingredients to them to change them up. I saw this recipe for guacamole grilled cheese sandwiches on Two Peas and their Pod and thought it would be good to give them a try, since I love avocado. 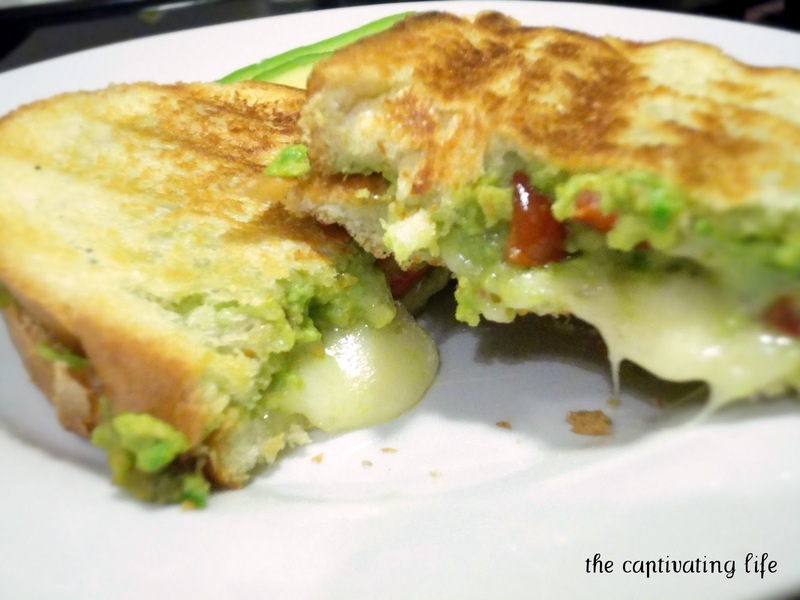 What an easy way to jazz up a grilled cheese sandwich! 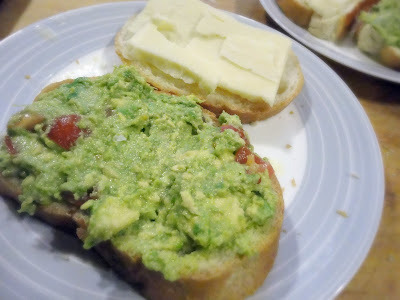 I was a bit worried they would be too rich, but the cheese and the avocado actually complement each other very nicely. I'll definitely make these again! Make the guacamole first by mixing the avocado, cherry tomatoes, lime or lemon juice, salt and pepper, and Tabasco sauce. You can either mix it all together in a food processor or just smash it all together in a bowl with a fork. I like leaving the guacamole chunkier for these sandwiches. There should be enough for two or three sandwiches. Butter one side of the bread slices. 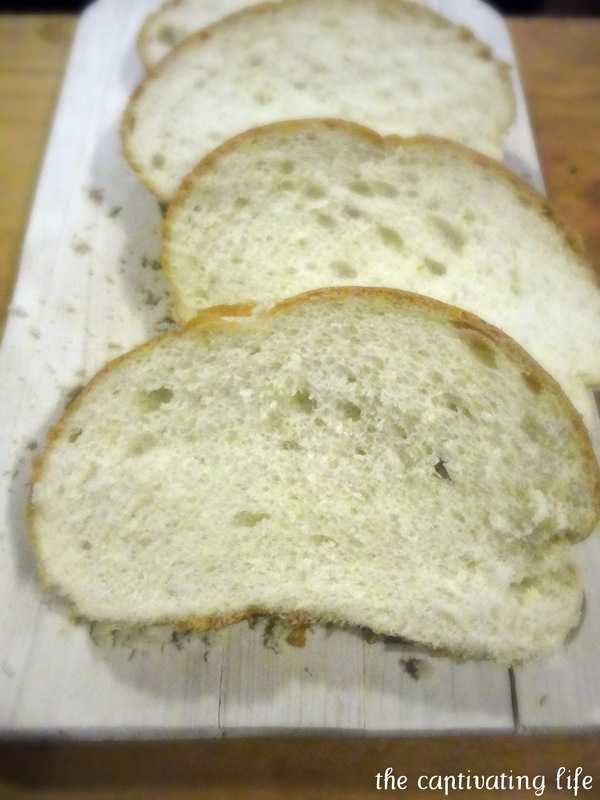 I often use normal grocery store sliced bread, but this time I bought a loaf of crusty bread and it was so much tastier. 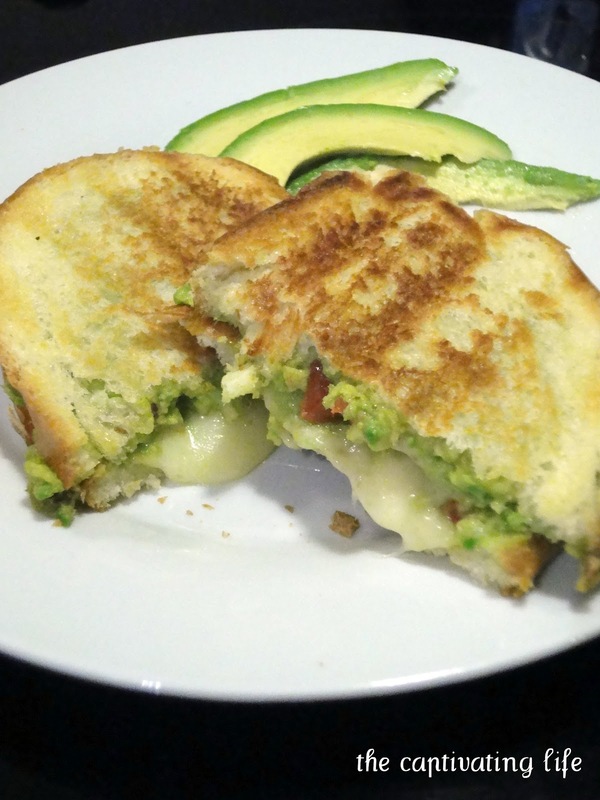 Layer the guacamole and cheese on the bread with the butter side out, and then grill away. We have a George Foreman grill that I used for the first time making grilled cheese sandwiches, rather than grilling them in a pan like I usually do, and they came out so much crispier and lighter. I'll never go back to using pans again! I like this version even better my than my bruschetta grilled cheese sandwiches (though those are tasty too). The Tabasco adds a nice zing to the richness of the guacamole and the mellow cheese. Yum! You're killing me tonight! Now I want to eat this sandwich! Avocado is so so yummy and this looks great. I never thought to put it on grilled cheese! Hi! Visiting from tt&j. Oh my! This looks so delicious! I want one right now. Totally going to make this next week! Thanks for the great new recipe! Im going to poke around your site some more. I would love for you share this at my Friday Link Up! Thanks for visiting my site. I appreciate it. And I have never had avocado on a grilled cheese sandwich but it sounds delicious. Will have to try that soon. 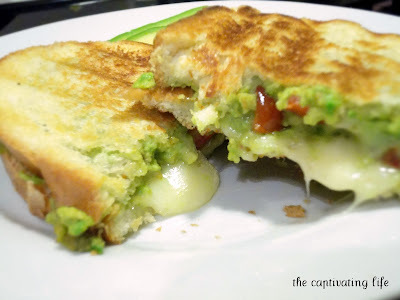 This grilled cheese caught my eye from the Six Sisters' Stuff linky ... had to pop on over and see it! Then ... I saw my blog in your reading list. Thanks so much for including me in it!!! I'm touched. This is a must try~ I love quac! Thanks for bringing this to ON THE MENU MONDAY. Looks delicious! 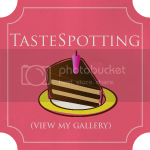 - Visiting you from "Inspired by Felicity" Blog hop. This looks delicious! What an interesting addition to the traditional grilled cheese. 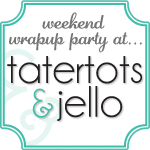 Lots of fun topics here and I'm looking forward to adding you to my blog roll! This looks fantastic and I'll be featuring it this weekend! 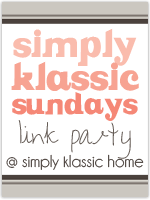 Thanks for sharing at Simply Klassic! Yay! You're a feature today! Just letting you know that I am featuring your recipe this week at Addicted to Recipes! 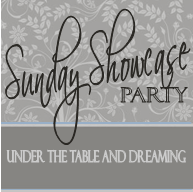 Thanks again for sharing at Scrumptious Sunday. Come on over and grab your button! Yep! That's gonna be dinner one night this week and boy is my husband excited! Looks so delicious! These looks delicious. Add the fact that I love guacamole and I love grilled cheese, and you pretty much made my perfect sandwich. Yum. Made & posted about this yummy sandwich this week! It was delicious!!! Thanks so much for the idea, Gleeful. Pop on over & check out your inspiration if you'd like. Thanks for stopping by. I love hearing from you! Are you a no-reply blogger? Make sure you have set your profile to show your email address so that you can get replies to your comments. The content on this blog, including all of the photographs, are the result of my work and are protected by copyright. Please do not copy my photographs or posts without first obtaining permission from me. If you would like to write or blog about one of the recipes on this blog, please rewrite the recipe in your own words, use your own photography, credit me and provide a link back to my post. Thank you for your understanding. © 2012-2013 The Captivating Life. Powered by Blogger.